Impact Of Childhood Obesity Goes Beyond Health Adults who have been overweight since high school risk a lifetime of disease, discrimination and poverty. A new study of obese 40-year-olds found those who were overweight teens were three times more likely to suffer chronic health problems such as heart disease, diabetes and hypertension. They were also much more likely to be unemployed or receiving welfare. The health effects of being overweight or obese are well documented. Extra pounds add extra risk for diabetes, heart disease and certain cancers, even among children. But new research also documents significant social and economic consequences of being overweight since high school. 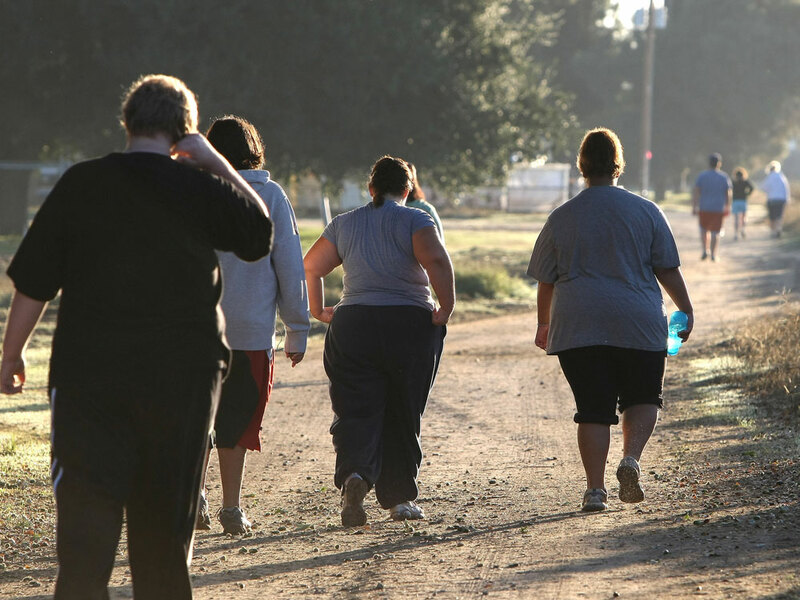 A group of teenagers take a morning jog at the Wellspring Academy in Reedley, Calif., in 2009. The school specializes in helping teens and college students lose weight. A new study shows teens who remain obese risk a lifetime of chronic health problems and poverty. Philippa Clarke, an epidemiologist at the University of Michigan, wanted to know what happens to people who've been overweight since adolescence. So, she used national data that tracked 5,000 high school graduates for two decades. She compared one group of 40-year-olds who were normal weight at high school graduation but gained weight gradually over time with another group of 40-year-olds who were chronically overweight since age 19. "We found that those people who were persistently overweight were more likely to not have gone on to have any further education beyond their high school [diploma]; to be receiving welfare or unemployment compensation at age 40 and to have no current partner," said Clarke. Clarke says the chronically overweight were 50 percent more likely to be unemployed, on welfare and single. Her study didn't address why, but Clarke suggests these adults probably experienced discrimination as children that diminished their self-esteem and, in turn, their aspirations. Overweight children feel inferior and they tend not to aspire to such heights because they don't believe they deserve it. Yale psychologist Kelly Brownell directs the Rudd Center for Food Policy and Obesity at Yale University, where research, by Rebecca Puhl, has found overweight people are 26 times more likely to report discrimination than their normal-weight counterparts. And, Brownell says, overweight kids are far are more likely to report being teased. "Teasing that comes directly from teachers in some cases, certainly from peers and even sometimes from their families. This gets internalized so overweight children feel inferior, feel like there's something defective with themselves and therefore they tend not to aspire. This isn't true in all cases, but a lot of them tend not to aspire to such heights because they don't believe they deserve it," he said. Brownell says discrimination against overweight individuals has increased 66 percent over the past decade despite the fact that more adults are becoming overweight. One of the reasons, Brownell says, may be that people think overweight adults have only themselves to blame. They should eat less and exercise more. But, he says blame is simply unreasonable, when it comes to children and weight, especially in low-income neighborhoods where markets are often inadequate and places to exercise are nearly nonexistent. "The social climate and our toxic food environment is so disastrous that more and more people are having trouble resisting it," Brownell says. "That's really what's explaining the high prevalence of obesity. So it's unfair to put people in an environment where weight gain is a very strong possibility and then to blame them for having the problem." Changing the environment is key to solving the problem. Pediatrician Joe Thompson is a specialist in childhood obesity at the University of Arkansas College Of Medicine. Thompson is also director of the Robert Wood Johnson Foundation Center To Prevent Childhood Obesity. He says Arkansas has made inroads into the obesity problem by offering more healthful choices in school cafeterias and vending machines and that those efforts have paid off in the battle against obesity. The rate of the epidemic has slowed nationwide and Arkansas has actually managed to stop the rate of increase among children, Thompson says.